"The football kingdom without tickets"
"White Center PAL Boxing Gym"
Caption: Steen seizes every opportunity to jump on to Peder's wheel chair and hitch a ride. Story: Steen and Peder Mondrup are twins and make up Team Tvilling. 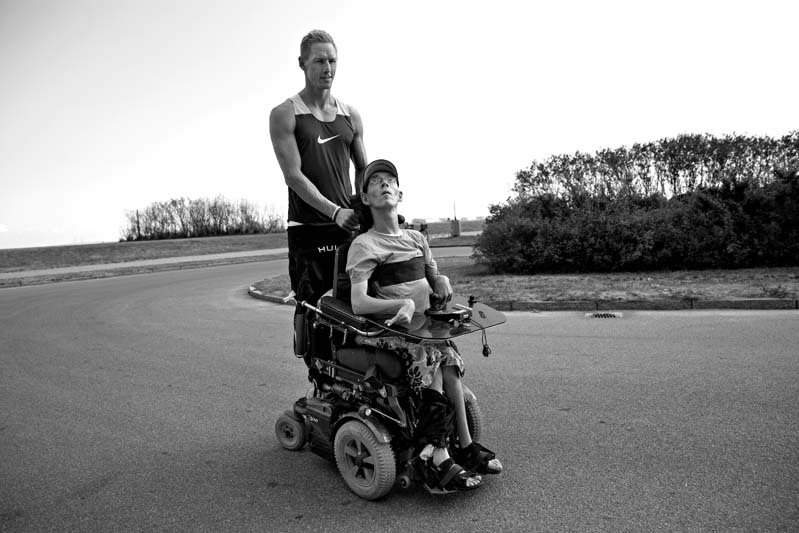 They borrowed a sports wheelchair and completed a half marathon together in Februrary 2013. Peder later told his brother that he had almost forgotten his disability during the race, and Steen got the crazy idea that they should train towards completing an Ironman competition. Their dream reached its climax in August of 2014, when they struggled across the finish line at the KMD Ironman in Copenhagen in a blaze of attention from the media. During the months leading up to the great day, I followed the brothers' training and their participation in other races. They were born in 1980 three months prematurely, and Peder did not get enough oxygen during the birth. Steen remained fully mobile, but Peder suffers from spastic paralysis, uses a wheelchair and needs assistance around the clock. Despite this, Peder has made a virtue of seeing possibilities rather than limitations in his life. This positive attitude, combined with a determined twin brother harboring wild ideas, means that the brothers have now added "ironmen" to their resumes. The shared project has strengthened their relationship, and the brothers also hope to help break down the fear of contact often found in the relations between the disabled and the able-bodied.